Rio Tinto's Mt Thorley-Warkworth Mine near Singleton. Courtesy of Rio Tinto Mt Thorley Warkworth. 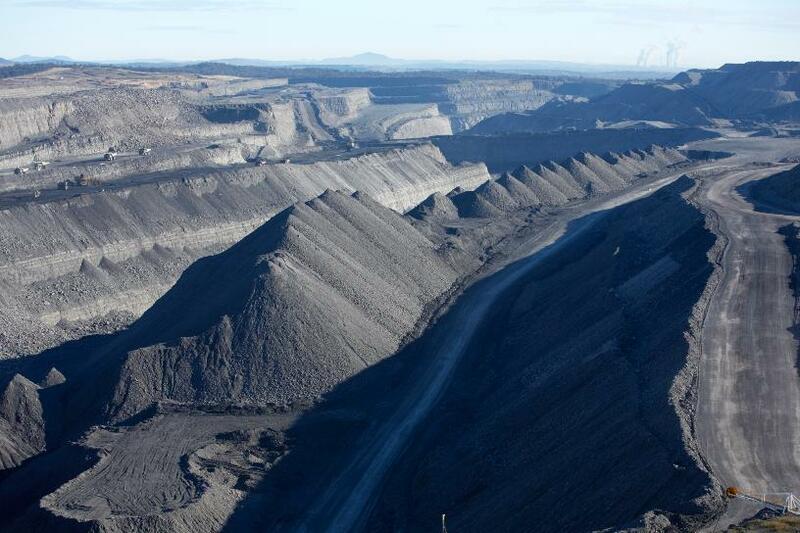 The first open-cut coal mine was the Commonwealth Coal Mine Number Two Lidsdale, Lithgow, NSW. It commenced operations on 30 November 1939. In the 1940s the underground coal mines of the Cessnock region became less profitable. There was a shift from the traditional underground mine to open-cut. The first open-cut mine in this district in May 1944 was the Caldare open-cut mine, which was situated adjacent to the Aberdare Extended Colliery. Many above ground mines were converted into open-cut mines, including Bellbird, Neath and Wallsend Borehole Collieries. Muswellbrook commenced underground mining operations in December 1944. In the early 1950s new mines were being established in Singleton to increase New South Wales coal production to up to 5000 tones per day. The mine pictured, Mt Thorley Warkworth is one of the largest in the Singleton area. New shovel double-side loading at Rio Tinto's Mt Thorley-Warkworth Mine near Singleton, 2012. Courtesy of Rio Tinto Mt Thorley Warkworth.